Jennifer Isaac is the Head Varsity Girls Tennis Coach. She has been playing tennis all her life. From playing junior tennis to college tennis to adult tennis, she has been ranked sectionally and nationally. She has been coaching at Del Oro since 2006 when she was the head Boy's Tennis Coach. For the 4 years she coached the boys, her team won the SFL league titles in 2006 & 2009, won the Sac Joaquin Section Division II title in 2009, and went to NorCal Championships in 2009. Five boys went on to play junior college, Division III, and Division I college tennis. Then in 2010 she switched from coaching the boy's team to coaching the girl's tennis team. Since then the girl's team won the SFL league title in 2013 & 2017, won the Sac Joaquin Section Division I title in 2013 & finalist in 2017, and went to NorCal Championships in 2013 & 2017. Many girls went on to play junior college, Division III and Division I college tennis. In 2003 she was the USPTA Norcal High School Tennis Coach of the Year. In 2008 she won the USTA Regional High School Coach, and in 2012-13 she won the GESPY's Coach of the Year Award. She runs a no-cut program believing that every girl deserves a chance to learn how to play tennis...A SPORT TO PLAY A LIFETIME! Tom Isaac is the Varsity Assistant Tennis Coach. He has been a successful coach for over 35 years. He has an incredible win/loss record in high school tennis, winning many league and section titles at every high school he has been a part of. Coach is known for making big impacts on players lives. He teaches life lessons through tennis and sees beyond the tennis court. He is also a great player who has been ranked nationally and is a USPTA Pro 1 teaching professional. He has won the USPTA Norcal High School Tennis Coach of the Year and has been Norcal Senior Player of the Year multiple times. We are lucky to have such a high caliber level coach to work with players serious about their tennis and teach new players to love this sport! Jill Butler is the Varsity Assistant Tennis Coach. She also has been a successful coach for many years. 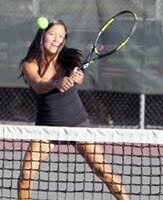 She played for Sacramento State while in college and continues to be a successful tennis player as an adult. She won the prestigious CIF Sac Joaquin Section Coach of the Year award for coaching and being a great example. She has a daughter, Jacy, who is a senior this year. We are lucky to have another high caliber level coach who is also a great role model for these young ladies! Jack Ryder is the Junior Varsity Head Tennis Coach. He is a military veteran of 20 years with the Marine Corps and Air Force and started playing tennis in his late 30's. He still managed to get in a lifetime of play through drilling, playing socially, and competing in USTA tournaments during this time! He is currently ranked #1 NTRP 3.0 player in Norcal and has raised and help coached three daughters who were all high school tennis stars. We are lucky to have such a knowledgeable coach who is a student of the game. He brings an excitement and enthusiasm to the sport that all the new players will gain when being coached by him.